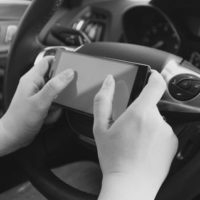 A new study indicates that the distracted driving problem may be more serious than first believed, and that the solution may be multi-faceted. It seems that restrictive laws have an impact. The states with tougher cell phone laws, such as Montana and Idaho, had much lower crash statistics than states with weaker laws, such as Pennsylvania and Connecticut. New features are helping as well. The latest iPhones have a “Do Not Disturb” function. The phones send auto-response messages to texts and emails if the user is in a moving vehicle. According to the study, iPhone 11 users have about an 8 percent lower incidence of distracted driving crashes. Not all the news is good. Over a third of motorists spend at least ten percent of their driving time on their phones. That translates to about three minutes on an average 29-minute journey. Cognitive (taking one’s mind off driving). Initially, some believed that hands-free cell phones were the answer. But these devices still involve visual and cognitive distraction. Moreover, these devices give drivers a false sense of security. In other words, hands-free is not risk-free. In Florida, damages in a serious injury distracted driving case include money for economic damages, like lost wages, and noneconomic damages, like emotional distress. Additional punitive damages may be available in some cases. The Sunshine State has one of the weakest cell phone laws in the country. Only Florida and six other states make texting on a cell phone a secondary offense. Florida peace officers cannot pull over drivers simply for texting or talking on their phones. In the spring of 2018, a stronger ban passed the House on a near-unanimous vote. But the bill will not likely clear the Florida Senate. Powerful GOP Sen. Rob Bradley vowed to block the bill, citing privacy concerns. The violation substantially caused the wreck. If the tortfeasor committed a jailable infraction, like DUI, the tortfeasor is usually liable for damages as a matter of law. But if the tortfeasor committed a traffic infraction, like speeding, negligence per se may only be a presumption of negligence. In distracted driving crashes, most drivers have a duty of reasonable care. They arguably breach that duty when they use their cell phones while driving. A Florida attorney can usually subpoena phone and usage records to establish breach. It’s important for lawyers to send spoliation letters in the early phases of the case, to prevent tortfeasors from destroying this critical evidence. If the cell phone use or other distraction caused actual damages, and these damages were a foreseeable result of the crash, the tortfeasor is financially responsible. Distracted drivers often cause serious injuries. For a free consultation with an experienced personal injury lawyer in Brandon, contact Reed & Reed. We have four area offices (St. Petersburg, Lakeland, Tampa, and Clearwater).